It appears the poll has now been removed by Good Morning Britain. 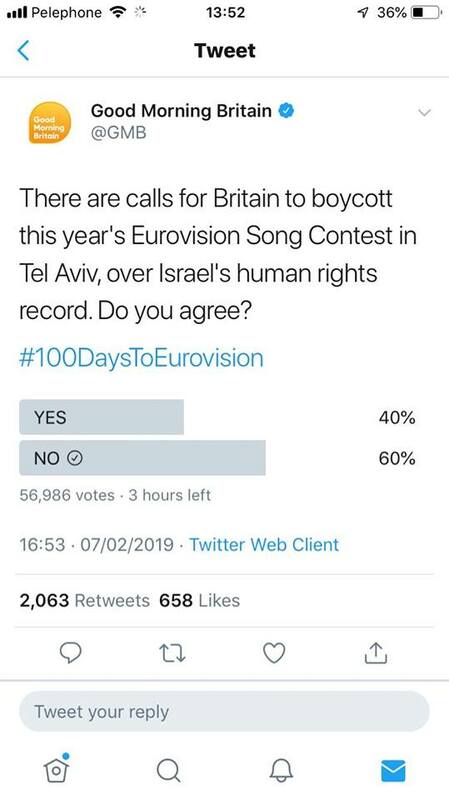 We do not know why at this time but the result was in Israel’s favour, 60% to 40% with 56,986 votes, when it got taken down as pictured below (thanks Sussex Friends of Israel). Good Morning Britain is hosting a poll to see what the public thinks about Israel hosting Eurovision and if the UK should boycott it. This wording is very clumsy and could be confusing to some. The answer, if you support Israel, is “no”. The UK should not be boycotting Israel. No country should. And anyone with any sense will be open to Israel holding such an event. Currently, the poll is running on Twitter and having more than 45,000 votes. No is “winning” with 53% of the vote. 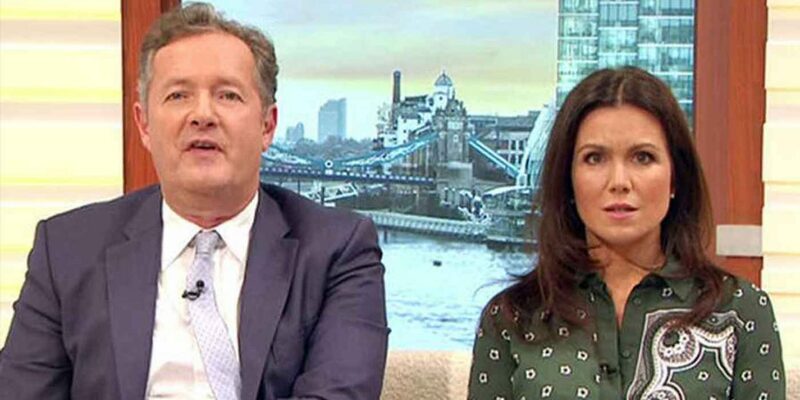 Why is Good Morning Britain running such a poll? We have to say that Twitter is not able to give a proper evaluation of the British public’s point of view. Twitter is very much a left-leaning platform and people from all around the world are able to vote on this poll. These polls are also very easy to manipulate, with bots and activist groups jumping on them to change sway the vote. Another thing that puts it at a disadvantage to Israel is the clumsy wording of the poll. The fact that Good Morning Britain has to even hold such a poll is sad. It could be an indication of how widespread the hate campaign against Israel has gone, or it could simply show bias in the GMB offices. We are also not even sure if this poll is just part of the social media team’s doing or if they will be discussing it on the show. Unfortunately, GMB’s highlighting of this issue is going to spread this hateful message further. Which is why we need to speak louder in our support for Israel. The Boycott, Divestment and Sanctions (BDS) Movement is anti-Semitic. It only attacks the Jewish state of Israel. There was no poll asking the public if the UK should boycott the Russian Olympics, there is unlikely to be a poll asking if England should boycott the World Cup in Qatar. This is simply an anti-Semitic campaign to demonise Israel and it is shameful that these polls exist in the first place. Previous50 days to Brexit | What does it mean for Israel-UK relations?